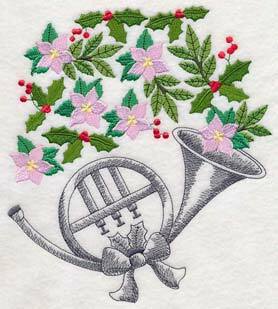 Create beautiful symphonies of Christmas music on your next embroidery project! 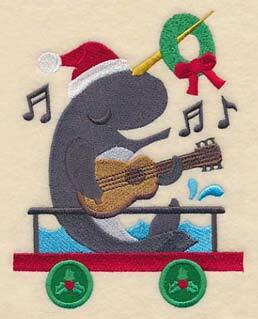 This week's new designs feature your favorite Christmas carols, holiday instruments, and more. 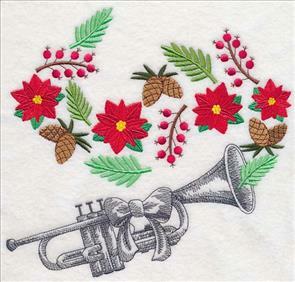 Stitch a watercolor wreath on a pillow, or add a Christmas chorus train to a mantel scarf or quilt. 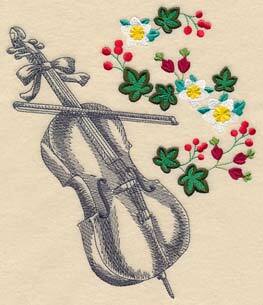 Beautiful instruments with festive foliage are gorgeous additions to any project. 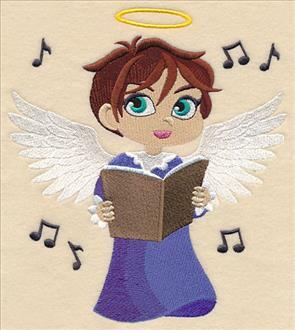 Plus, Christmas carol sheet music, sweet angels, and more! A creamy white pillow is the perfect place to showcase beautiful watercolor designs. 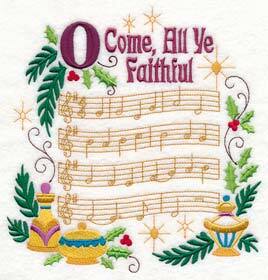 Gorgeous festive foliage in watercolor surrounds the lyrics to classic Christmas carols in these breathtaking designs. 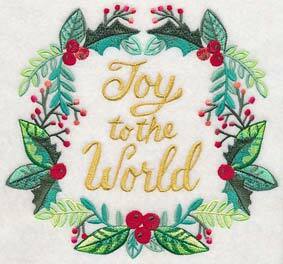 Metallic gold thread adds an extra-elegant look to the text. 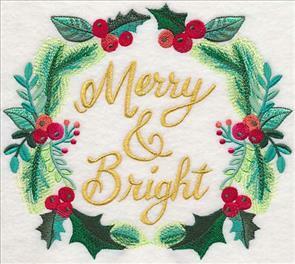 7.45" x 6.86" and 6.37" x 5.86" and 5.28" x 4.86"
Use these wreaths on pillows, quilts, or wall hangings to celebrate the season. 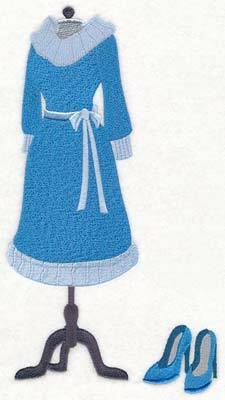 For more information regarding stitching with metallic thread, click here. 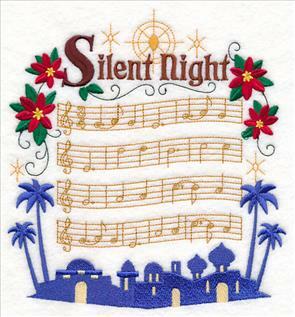 7.79" x 7.63" and 7.03" x 6.89"
5.98" x 5.86" and 4.96" x 4.86"
Have a merry, musical holiday with designs featuring the sheet music to your favorite Christmas carols and hymns. 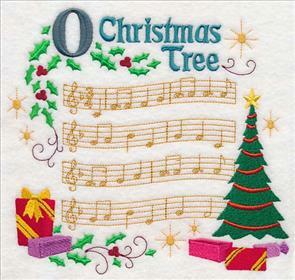 Ornaments, holiday flowers and greenery, and the name of each song surround the music for a sophisticated look. 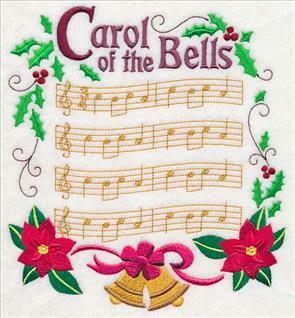 6.89" x 7.60" and 5.83" x 6.43" and 4.87" x 5.38"
Add these Christmas chorus designs to tote bags, quilts, pillows, and more as a fabulous way to stitch for the season. The bright colors and graceful gold add a stunning look to any project. 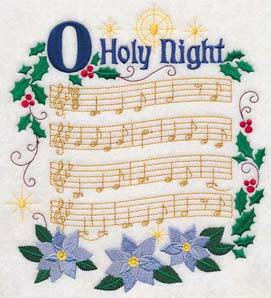 Along with Deck the Halls and O Holy Night, four other carols are available for your holiday stitching (Silent Night, Carol of the Bells, O Come All Ye Faithful, and O Christmas Tree). Stitch all six together, or feature your favorite on its own! 6.85" x 7.49" and 5.85" x 6.40" and 4.86" x 5.32"
These designs are a gorgeous way to add holiday flair to your home. Stitch on a mini-quilt for the living room, or add to a fabric gift bag! 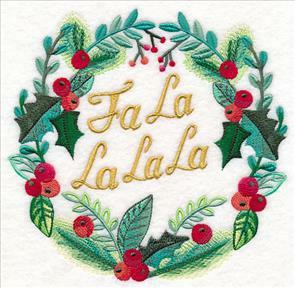 7.37" x 6.86" and 6.29" x 5.85" and 5.22" x 4.85"
As the songs of the season fill your home with holiday spirit, add them to your embroidery, too! Get all of these Christmas carol designs now in a design pack. 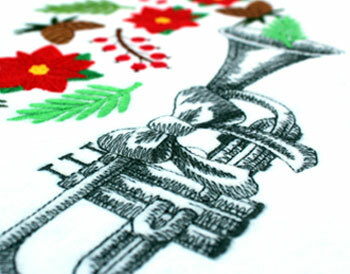 One-color sketch-style musical instruments release beautiful sounds of the season in these designs. 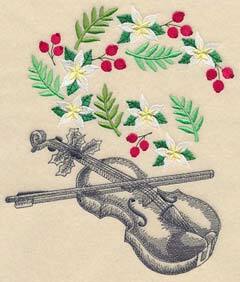 Winter greenery take the place of the music notes for an unexpected holiday twist. 7.80" x 7.48" and 6.11" x 5.86" and 5.07" x 4.86"
The contrast between the light, sketch instruments and the colorful pine cones, poinsettias, and berries make a striking addition to any project. 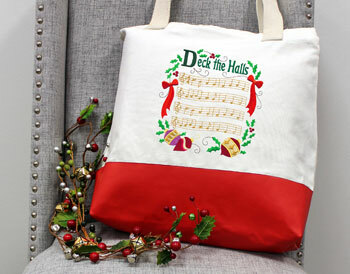 Pick your favorite instrument to add festive flair to tote bags, pillows, wall hangings, and more. 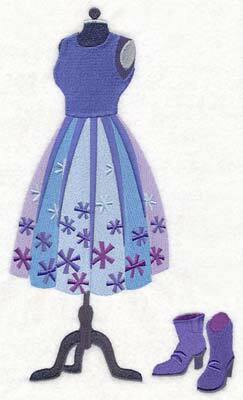 They're an eye-catching way to stitch for the season. 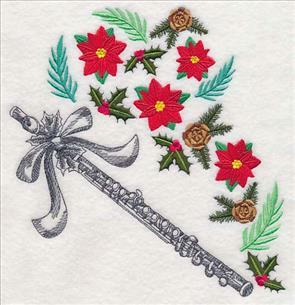 6.90" x 7.59" and 5.85" x 6.44" and 4.85" x 5.34"
Six of the instruments are available for your holiday embroidering -- a violin, trumpet, clarinet, French horn, flute, and cello. 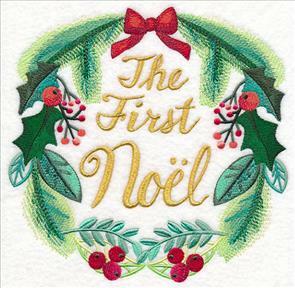 Add to a quilt, a set of placemats, or even a tree skirt this Christmas! 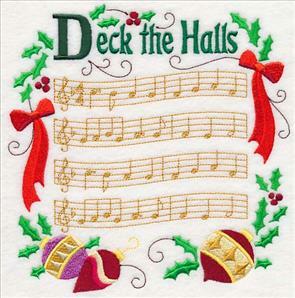 6.73" x 7.79" and 5.85" x 6.78" and 4.85" x 5.62"
Create your own seasonal symphony with these musical designs. Get them all now in a design pack. All aboard! 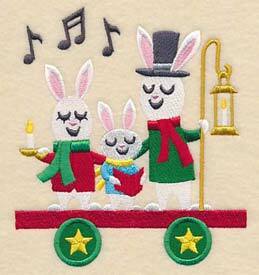 Hop on this Christmas train to hear the sweetest sounds of the holiday season. 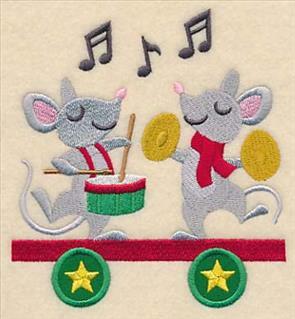 Each car features different adorable animals making music to celebrate Christmas. 4.85" x 5.47" and 3.00" x 3.39"
These designs are perfect for creating a tree skirt, quilt, or this mantel scarf! 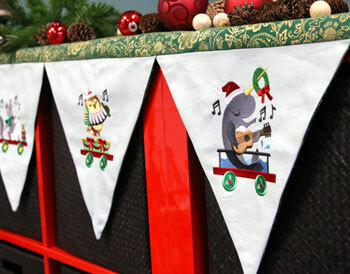 Each train car is featured on its own banner, and it's a great way to decorate for the most wonderful time of the year. See how to make this mantel scarf here. 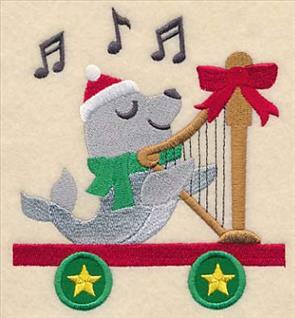 Here a polar bear plays the blues on his saxophone, while a seal hits all the right notes on a harp. There are nine different cars (including an engine and caboose!) available -- pick your favorites to personalize your project. 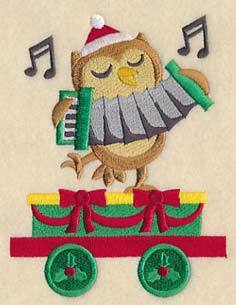 4.71" x 5.26" and 2.91" x 3.26"
An owl creates holiday music with an accordion, while a pair of wolves howling add sweet sounds to the orchestra. 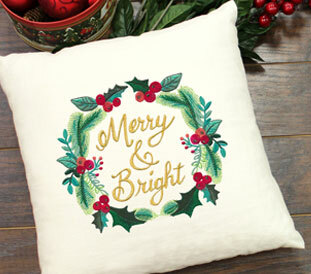 Add these designs to a series of stockings, or use to update your new favorite table runner. 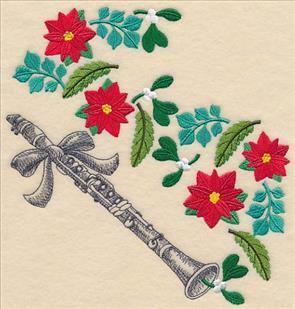 4.63" x 4.93" and 2.86" x 3.06"
Christmas colors and accents (like Santa hats, wreaths, scarves, and more) add a distinctly jolly feel to each design. 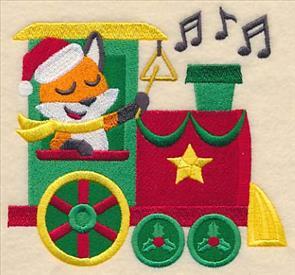 The bright colors and clever details make this Christmas train festive and fun. 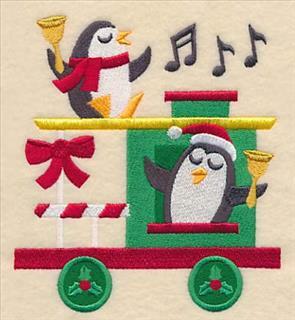 4.66" x 5.10" and 2.88" x 3.16"
Finish off the holiday train with a pair of penguins playing the bells on the caboose. A great way to decorate for Christmas! 4.86" x 5.42" and 3.00" x 3.36"
Choo choo! 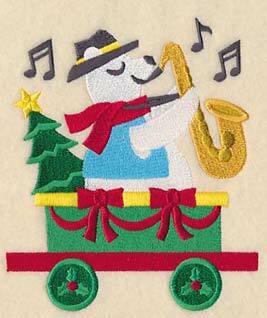 Take a trip on a train this holiday season with these musical designs. Get them all now in a design pack. 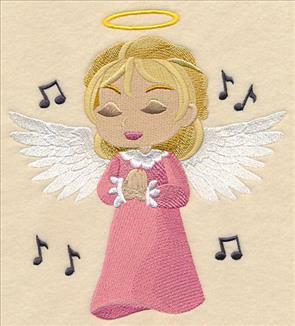 Sm - Designs smaller than 4" x 7"
Soft and sweet Christmas angels sing heavenly notes in this trio of designs. 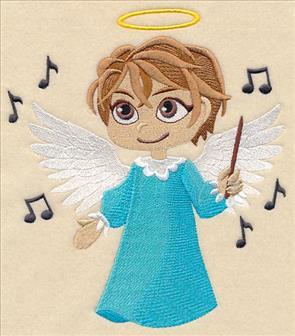 An angel holding a songbook, and angel conducting the choir, and an angel singing in praise are sweet additions to any holiday project. 6.88" x 7.71" and 5.84" x 6.54"
6.84" x 7.81" and 5.86" x 6.69"
4.86" x 5.55" and 3.38" x 3.86"
7.02" x 7.79" and 5.85" x 6.50" and 4.85" x 5.39" and 3.47" x 3.86"
Mary Pat is a big fan of the seasonal dress forms, and was looking for some to add to her collection. 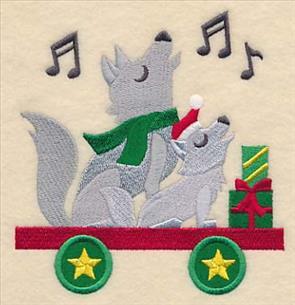 Here, two wintry versions are perfect for stitching to celebrate the snowiest season of the year. Thanks for the suggestion, Mary Pat! 6.40" x 11.75" and 5.13" x 9.42"
6.86" x 11.59" and 5.57" x 9.42"
4.63" x 7.82" and 4.06" x 6.87"